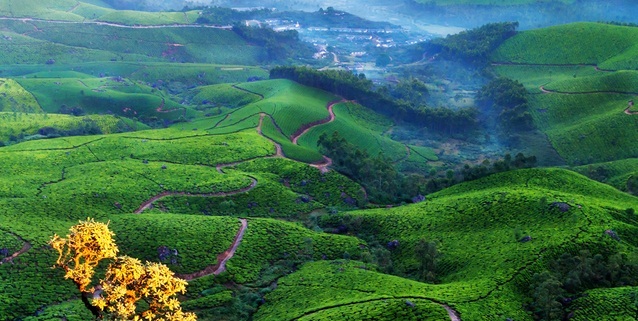 Munnar - Kumarakom Tour Package | Budget Package Tours from Munnar to Kumarakom Kerala, India. Pickup up from Cochin Airport / Railway Station and proceed to Munnar. On the route visit one of the most enchanting Waterfalls in Kerala-Cheeyappara Waterfalls on the Kochi-Madhurai Highway (NH 49). After reaching Munnar have a freshup and then let’s go to Blossom Hydel Park-just 3 kms away from Munnar Town.Best place for nature lovers- a colorful park with rich beautiful flowers and greenery. It offers adventure trails, boating, nature walks, bird watching with facilities for cycling, roller skating, badminton as well. Return back to the hotel / resort.